Having long, textured hair can be a bit of a burden sometimes. I am constantly getting hair all over my bathroom, I go through tons of hair products and my hair takes forever to dry. I have tried many, many different products when it comes to washing, styling and drying. One product in particular that I swear by is my microfiber hair towel. I firmly believe that everyone with medium to long hair should have one. Of course, regular cotton towels can work fine. But, they NEVER stay on my head, and they make my hair frizzy. 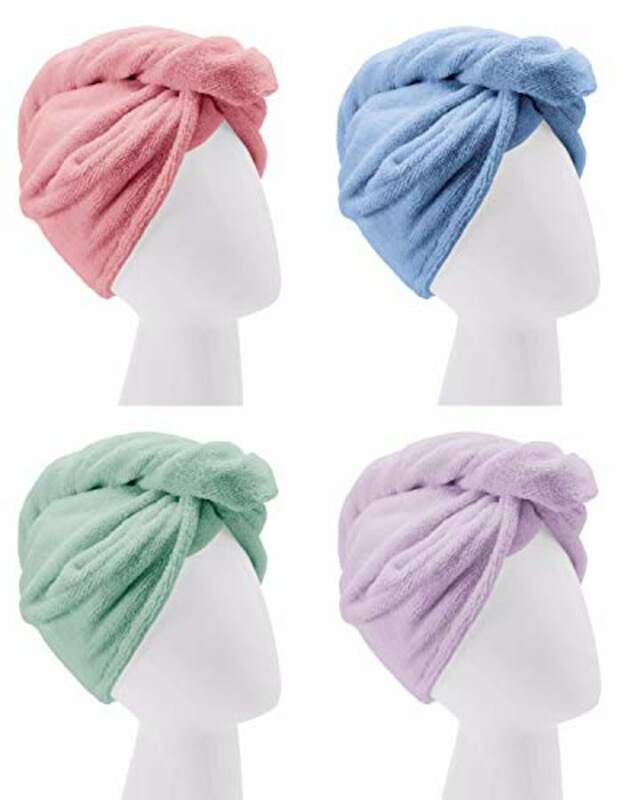 A few years ago, I started using the Turbie Twist hair towels and now I never wash my hair without one. I get a 4 pack for $22, making them average out to about $5 each. Not bad for an anti-frizz miracle! Also available at Bed, Bath and Beyond and Walmart. The unique twist and loop system really helps the hair towel stay in place After you get out of the shower, you flip your hair over with your head facing the floor. The back of the towel fits perfectly around my head, and then I wrap my hair with long part. Twist it up, pull it back and then it stays in place with a small elastic loop in the back. The microfiber material is super absorbent and helps to prevent frizz. It dries hair faster than other towels I've used. Plus, it will fit any head size. Obviously, I love the fact that it cuts down on frizz and dries my hair thoroughly. But, my favorite part is that it keeps my hair out of the way. So, I can brush my teeth, do my makeup and pick out my clothes while my hair is drying. For that alone, it's worth it. Pro tip: If you have curly hair like me, put your hair product in your hair while it's still wet, then wrap it in the Turbie Twist. After my hair has had a little while to dry, I'll often just take it out of the towel, part it, give it a shake and a scrunch and it's ready to go! No matter what hair texture you have, if you have long hair at all then I have faith the Turbie Twist will change your life. And, you can even get them in fun colors! Trust me, my morning routine improved immensely.